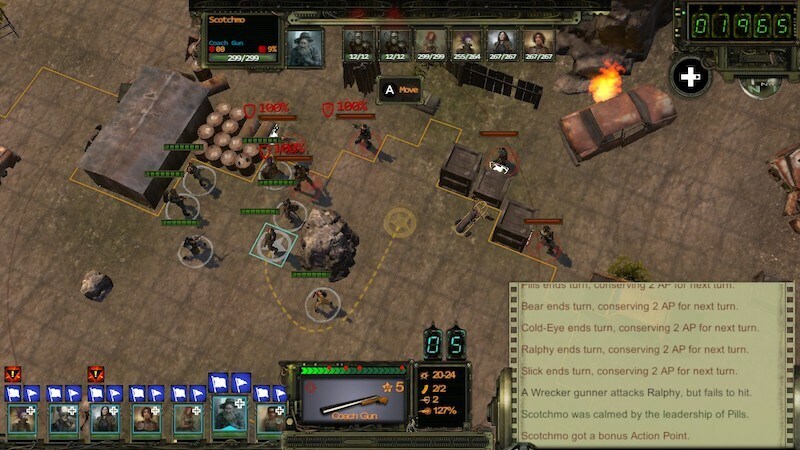 Wasteland 2: Director's Cut for the Nintendo Switch is an expanded version of 2014's Wasteland 2, a PC game that was successfully crowdfunded through Kickstarter. The original Wasteland, of course, released in 1988 and its post-apocalyptic setting famously became the basis for the hugely popular Fallout series. Wasteland 2: Director's Cut has been available for PC, PS4, and Xbox One since 2015, and the expansion is now available for Nintendo Switch as well. Does this version bring anything new to the table? Let's find out. The events of Wasteland 2 take place in the Arizona desert after a nuclear war devastates the US. You control a squad of soldiers, known as the Desert Rangers to aid survivors in the area. You'll square off against all manner of foes such as killer plants and bloodthirsty mercenaries to cyborgs and nuke-worshipping monks with a death wish in turn-based combat much like XCOM, with your crew arranged on a grid and where every action playing out like a game of chess. It's strategic fare that holds its own through Wasteland 2's 40 hours of gameplay and doesn't get old one bit thanks to nuanced options like being able to aim at specific body parts while attacking enemies for a tactical advantage, one of the rare new add-ons that give this game the 'Director's Cut' moniker. Each member of your squad is fully customisable, letting you tweak its attributes, skills, and much more. For those who haven't played traditional PC role-playing games, it can be overwhelming. Thankfully, Wasteland 2 has a default squad option which gives you a well-rounded team to begin your journey. Events of Wasteland 2 start off with you being tasked to find the killer of one of your colleagues. It eventually unfolds into a sinister plot involving AI, robots, and murderous factions aplenty. The writing in Wasteland 2: Director's Cut is undoubtedly its strongest points thanks to great dialogue and descriptions. All that's backed up by some superlative voice acting, which goes a long way towards bringing a sense of immersion to the proceedings. In fact, Wasteland 2's story is the biggest reason to give it a shot, and that's also because the game is far from being visually stunning. There's a muted colour palette featuring several shades of brown which makes distinguishing between environmental objects and enemies problematic. Even your characters tend to blend in at times, which makes it tough to find them while exploring Wasteland 2's many post-apocalyptic vistas. Furthermore, the user interface in Wasteland 2 on the Nintendo Switch is far from intuitive. Fonts are microscopic, icons look blurry, and going through its menus is a cumbersome, painful affair in both docked and handheld modes. 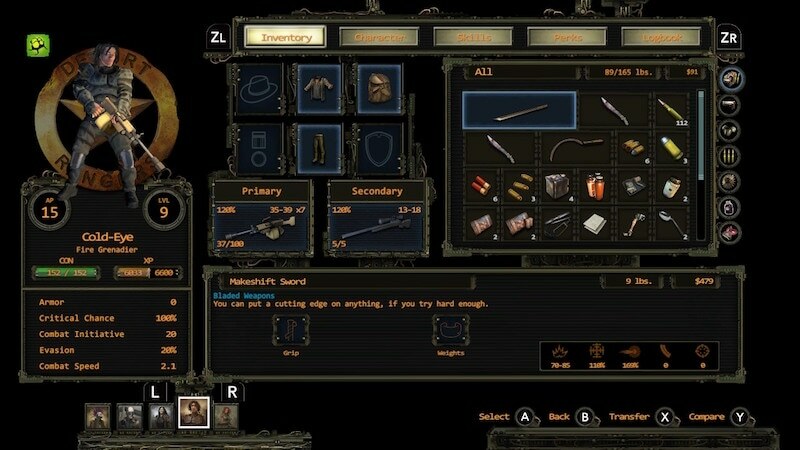 Making your way around its many pages for weapons, perks, and abilities is perhaps Wasteland 2's toughest enemy. The UI elements and descriptions are tough to comprehend partly due to the font choice and partly due to the many tool tips that pop up at random make it more muddled than it should be. It doesn't help matters that the complexity is further carried forward thanks to the game's camera which tends to cut off vital pieces of text. This doesn't just harm the game's presentation, but impacts its gameplay as well. As you trudge through Wasteland 2, you'll need to make combat decisions based on how powerful or weak your opponents are, and while that information is available to you, it's obscured due to this. Granted, the Nintendo Switch isn't the most powerful device what with the likes of Wolfenstein 2: The New Colossus seeing massive cutbacks in performance to make it to the hybrid console, but Wasteland 2's problems on the Nintendo Switch stem from an absence of adapting what essentially is a traditional PC keyboard and mouse experience for a console. That's especially disappointing when you consider other tactical games such as Disgaea present themselves exceptionally well. Some of these concerns could be alleviated by using the Nintendo Switch's touchscreen, but Wasteland 2 doesn't support it either. All in all, while Wasteland 2: Director's Cut for the Nintendo Switch gives you a new way to experience the post-apocalyptic desert, it's far from the best option thanks to its poor presentation. With the PC version available for Rs. 699 ($30 in the US) in India versus the $30 tag (around Rs. 2,100) for the Nintendo Switch edition, you're better served checking out that version instead thanks to it being tailor-made for the platform's controls. Wasteland 2 on the Nintendo Switch is just painful in comparison. Gadgets 360 played a review copy of Wasteland 2: Director's Cut for the Nintendo Switch. The game is out now for $30 (around Rs. 2,100) on the Nintendo Switch eShop. product Wasteland 2: Director's Cut is out for the Nintendo Switch, but is it a faithful port of a classic? Read our review to find out.